Leading bridge and engineering services specialist Mabey is introducing its innovative 100% steel bridging solution at Bridges 2018. In partnership with Atlantic Industries Limited (AIL), Mabey is now offering an alternative to traditional ‘hybrid’ steel and concrete solutions to provide a 100% steel, fully-recyclable solution, featuring a steel bridge combined with steel abutments, which can be installed more quickly, safely and efficiently. Developed by Canadian firm AIL, the steel bridge abutment and retaining wall solution, Bolt-A-Bin®, is made up of a strong cellular corrugated steel container into which a mass of soil can be compacted. This removes the need for concrete pouring, saving both money on materials and the cost of installation, while minimising the impact of on-site works on the environment. Working in tandem with Mabey’s Compact 200™ (C200) solution, the abutments are lightweight and easy to assemble on site, delivering greater versatility, especially in remote locations. Bolt-A-Bin can be configured in several dimensions and heights to incorporate changes in elevation which vary across different project applications. The unique design of the corrugated steel container, combined with the strength of the enclosed mass of earth, enables it to withstand ground movements without cracking or bulging, and ensuring the weight of a bridge and its load can be carried safely. Mabey and AIL’s innovative solution was most recently demonstrated on a project in Liberia, the first development of its kind in Africa, on behalf of the Liberia Electricity Corporation Project Implementation Unit at the newly re-opened Mount Coffee Hydropower Plant. 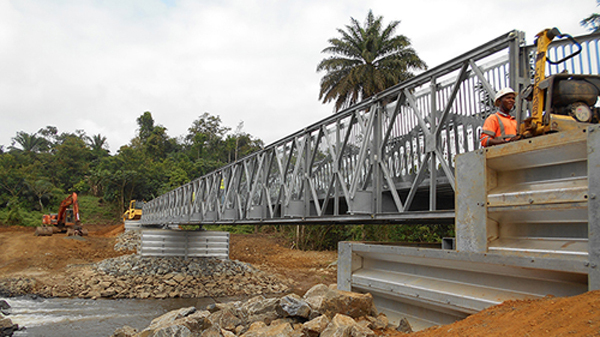 A two span, 52-metre-long C200 bridge was installed by Dawnus International Ltd. using Bolt-A-Bin abutments to provide a safe crossing over the new reservoir for the local community, which is dependent on trade in fishing, farming and the production of charcoal. The bridge was erected in a record time of four days. Since this project, several of Mabey’s customers across the world are looking to use Bolt-A-Bin for both temporary and permanent bridging. It also has relevance for large infrastructure projects, such as HS2. Mabey will be showcasing this innovative solution at Bridges 2018 (Stand C15) where customers will be able to experience it ‘first-hand’ in Virtual Reality. Mabey’s innovative Structural and Environmental monitoring capabilities will also feature in the Innovation in Bridge Management stream of the conference programme.